When you go for a traditional sitar lesson it's a matter of listening and then copying. 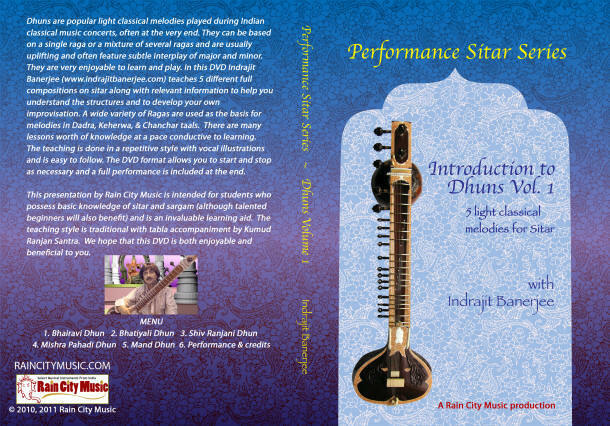 In this way Maestro Indrajit Banerjee takes you through no less than 5 full Dhuns (light classical/folk melodies) on sitar. You'll learn each line and watch as it's applied in practice with embellishments or an impromptu demonstration and improvisation to spur your own creativitiy. While our productions are by no means intended to substitute for a teacher, they can be a very valuable asset to your practice with MANY lessons worth of material for the aspiring sitarist. Learning Dhuns are a good way to begin your adventures in improvisation as they are shorter pieces and easier to learn the main melody lines in a much shorter time than a full Raga. Bring your enthusiasm and be prepared to wear out your pause button as you go through nearly 2 hours of intensive training. He is calm and patient and clear so is the quality of the production. Just to say the dvd's have arrived and so far i'm delighted with what i've seen. There is plenty in there for me to learn from so thanks very much to you and Indrajit for being bothered to make them. I hope they are a big success for you. I will certainly be interested in any new releases. just let me thank you very, very much for getting me these absolutely great DVD´s! They arrived today in perfect shape, this time again with no customs hassle at all :-) ! From what I´ve seen during my first hours - but also from the online-trailers - I´m deeply impressed by the musical quality and vast amount of technical details offered. Indrajitji definitely is a great artist AND teacher! BTW: If ever he will be giving lessons in Germany could you please let me know? So, let me thank you very much again for making these treasures accessible to us all!